Hi Guys, this is one of my pieces. As I may have mentioned I am an Artist as well as a Business Woman. But here i want to introduce you to y Art in case you never got curious enough to go visit my other site at GaFra.org (my art site). So what’s the story behind this piece called “Gran Couva Huts”? Most pieces have a story behind how they got created. Well, ever so often my husband and I go for a drive into a semi country area where there is this estate or garden center that sells plants. On the way you pass these huts that once formed part of an old plantation. The people who worked on this plantation lived in these huts. Even today there are still a few families that live in one or two of them. I wanted to give you a preview into my art and what types of stories will come along with them. 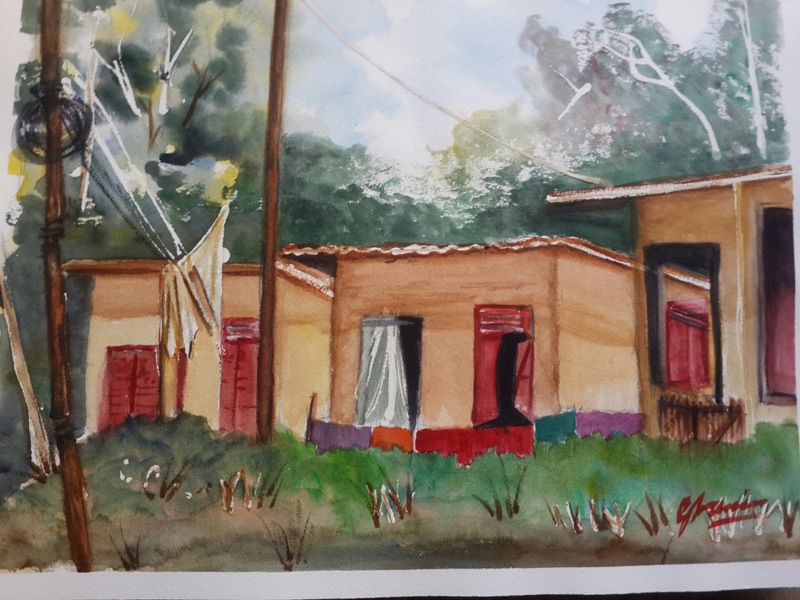 For this piece, the huts themselves and how they looked captured my attention. They had a sense of history about them seeing as they are in Gran Couva, a place known for having the finest cocoa in the world. This is due to the soil and the climate converging to create a cocoa that makes the best chocolate ever. I work in Watercolour. After taking the photo I then render it and maybe a few days later I start painting. I leave it to look at it for a few days to decide if it needs to be tweeked, then I’m done. I’ve been painting for the last 7 years and I started off doing watercolours in an Art class, then I did an online class with a Canadian Artist called Heri Arifin, then I did a one week workshop in Boone, North Carolina with an Artist called Alvaro Castignet. From there I started painting as much as possible and when you paint your work starts to collect and you run out of space. I heard about upmarkets. These are like market fairs where you pay for a table and you sell your products. i’ve been doing upmarkets for the past 2 years and that is how I sell my smaller pieces. I also found an abstract artist online whose work I really liked and tried to copy his style but instead I developed my own style, so now do quite a few abstracts. This is one of my earlier abstracts. I also paint scenes from my country as well as depictions of the architecture, that I love. So my lovies bye for now, we will chat again soon.